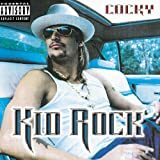 These are lyrics by Kid Rock that we think are kind of funny. Mr. Rock, are you sure that a pig's smell can travel that far? I think these lyrics are funny (not ha-ha funny, but other kind of funny) cuz he's either telling people subliminally to get high through his songs or inviting them to come and get high with him. It's pretty funny if you listen to it.